Bundesliga | UEFA Euro 2016 | Germany vs Slovakia - as it happened! Germany had the upper hand early on against Slovakia in Lille thanks to a Boateng goal. Euro 2016: Germany 3-0 Slovakia - as it happened! 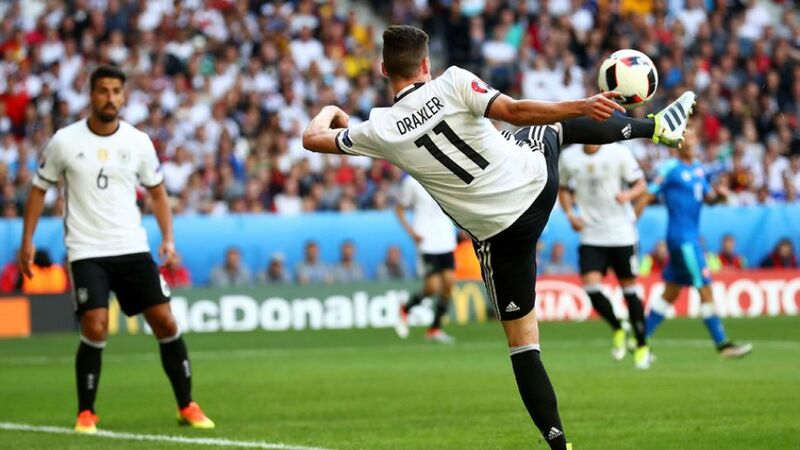 Look back at how goals from Jerome Boateng, Mario Gomez and Julian Draxler earned Germany a 3-0 win over Slovakia in Lille and set up a UEFA EURO 2016 quarter-final against either Italy or reigning champions Spain. The world champions ease through to a quarter-final with either Spain or Italy in Bordeaux on 2 July...what a game that will be, a real EURO classic. Wonderful one-touch passing move ends with Hector in space on the left...his cross is miscued, but almost finds its way into the far top corner of the net...he didn't mean that, but it was very nearly a fourth for Germany. Dangerous ball into the six-yard box from Podolski on the left, well cleared by Salata with Gomez looking to pounce. A little shake of the head from Durica as he prepares to take a throw-in tells its own story...Slovakia know they are beaten, and by a top-quality side. Schweinsteiger replaces Khedira in the centre of the park. Goalscorers Boateng and Draxler make way for Höwedes and Podolski respectively. A free-kick is touched to the side and Durica drills a shot just wide of the post...for once, Neuer looked beaten. The half-time whistle sounds in Lille...Germany with a healthy cushion, and look to be heading to the last eight despite that missed Özil penalty. Müller finds space just outside the Slovakia box in the right-hand channel, but his shot - though powerful - rises over the bar. Slightly wasteful the Bayern man there...still waiting for his first goal of the tournament. The ball drops invitingly for Özil just inside the box, and his half-volley is a whisker away from doubling Germany's lead...Kozacik wasn't getting anywhere near that one. A first dangerous foray into the Germany box is led by Hamsik, but Neuer has nothing more complicated to make than a comfortable catch. Kozacik goes to his right and pushes away Özil's rather weak effort from the spot...it was a good height and too close to the Slovakia 'keeper. Skrtel adjudged to have pushed Gomez in the back...penalty. We know Germany's potential path to the Euro 2016 final, but what does the future hold for your favourite Bundesliga team? All will be revealed on Wednesday, 29 June, when the fixture schedule for the hotly anticipated 2016/17 Bundesliga campaign will be published. Find out more on our specially dedicated site. Andre Schürrle has only had a bit-part role to play for Germany so far in France, but the VfL Wolfsburg midfielder isn't complaining. "We all want to play - as much as possible and preferably in the starting line-up, but like I said: it's important that all players realise that this is about the whole team," the 25-year-old told dfb.de recently. "There can only be eleven players on the pitch and you can't win the European Championship if the other twelve are unhappy [...] Whether we're playing ten, twenty, eighty, or ninety minutes - we need to give 100 percent when we're on the pitch. There's no room for egos." Hetha Berlin defender Peter Pekarik, who has a broken nose, will play with a special bandage across his face tonight. "When I broke it before, I had a mask on my face for three minutes before I had to take it off, as it was bothering me," the Slovakia international explained. "So this time it’s different - we used a special cover, specially taped. So, I think this is the best solution for me and there shouldn't be any problems. I tried it on in one training session already." Germany head coach Joachim Löw is confident FC Bayern defender Jerome Boateng will be fit to face Slovakia after shaking off a calf problem. "He took part in out final training session," he revealed at Saturday's pre-match press conference. "He actually arrived a bit early to do some tests on the pitch as he didn't train yesterday. He didn't raise any concerns afterwards and will receive further treatment tonight. As things stand, he'll play." Germany beat Ukraine, drew with Poland and edged Northern Ireland on their way to topping Group C without conceding a single goal. The performance against the northern Irish was the best of the lot, though, thanks in no small part to the inclusion of 21-year-old FC Bayern München talent Joshua Kimmich at right-back. They say he's the 'next Philipp Lahm', but the man himself is having none of it: "[Lahm's] played there all his life; I've only played there once. There's no comparison really."